A second attribute in pursuing creative ends is humility, and the capacity to allow for and embrace learning as we pursue creation and change. 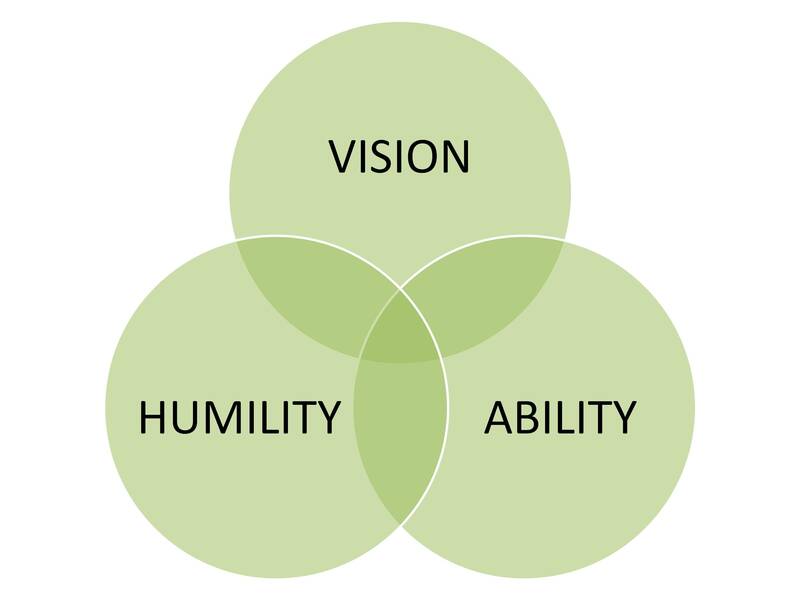 Humility brings an expectation that we will learn and our visions will evolve over time. Without humility, we might never create in the face of natural ambiguity, or often condemn ourselves to grandiose or fixed visions that lack depth and refinement from embedded learning. And then there is the attribute of ability, by which I mean skills or facility with tools that allow us to more reliably choose, inform, pursue, and evolve our visions and aims. All of us have various natural abilities, and most other needed creative abilities can be learned and developed over time. I am just back from a two-week design retreat, where I earned my Permaculture Design Certificate (PDC). It was an intensive learning experience, filled with poignant discussions of beginnings, ends, and means. Based on my experience, I would recommend the course to designers and builders everywhere – and would note that the 72-hour course is offered around the world. Not only does the PDC, and the overall discipline of permaculture, provide essential information on sustainable design and building, it also creates a powerful context and set of goals for use across a broad spectrum of creative efforts. And the PDC, as an immersive learning experience, provides amble opportunities for new personal vision, humility, and ability to anyone interested in attentive design and sustainable building today. As evidence of this, I thought I would share the following seven permaculture design principles, which came to me courtesy of Warren Brush at Quail Springs Permaculture. Together, they provide an immediately useful framework or set of tools to improve our designs and buildings (the full list of twelve principles can be reached here). The principles I have selected will also give you a flavor of the PDC experience and its widely ranging content. And they may help you to better or more fully begin projects with needed ends in mind and perhaps realize new quality, progressivity, and vitality in your creative endeavors. 1. Move from the large to the small – a key permaculture principle is similar to Covey’s habit of end-orientation, in this case by encouraging clarity on the overall design or construction effort. We may, for example, have a clear idea for one or more components of a design, but may lack an adequate sense of how these elements fit together, interact, and perhaps conflict. Thus, holism is encouraged in the permaculture design process and a first focus on a project’s highest priorities and needed design features. 2. Observe and gather data from multiple perspectives – similar to the principle of holism or beginning with the big picture in mind, permaculture encourages examining design needs and options from many viewpoints and thus over a reasonable period of time. This can include getting input from others, looking for best practices, or simply putting work away and examining it with fresh eyes. If you think about it, no design ever created or crafted is perfect. This fact can and should provide an ongoing motivation for us all to look for missing considerations and improvement opportunities in our work. 3. Be clear on our immediate and ultimate context – no design or building idea exists in the abstract, even exploratory studies and those we never intend to bring to life. All creative work occurs in a context or setting, one that gives the project meaning and relevance. This creative context can be our life and thoughts, or it can be a particular city, site, building, or even room where a design is intended be placed. By placing our designs and plans in context, we move from abstract to practical thinking, and naturally gain new perspective on and insights into our work. We can examine how designs might or will function, see unexpected dimensions of our projects, and even probe the need or motivation for specific design features or an overall project (via powerful why questioning). Context informs and grounds our ideas and aims, and leads to new information and insights. 4. Be clear on needed functioning – the principles of holism, perspective-seeking, and context-placement will reliably and often greatly improve our designs and plans, but they are not a substitute for clarity on required functioning in our designs and constructs. Functionalism is of course widely advocated in modern design, but is still often overly subordinated to stylistic considerations in many domains. And this fact extends to the essential function that is the economical production and use of any designed object. I will leave you to pick a favorite example of overlooked function in a product, building, or interior design, whether your own or another’s, but will underscore the widespread and recurring nature of this familiar oversight in design today. 5. Get multiple functions from each design element – an important principle of permaculture design, one that you may not have encountered before, is to develop individual design elements so that they have multiple functions. A roof support, for example, might also support a trellis and downspout, while providing visual interest, shade, and a surface to hang items. This approach of course encourages economy and functionalism. But it also promotes new creativity and attentiveness to details, and can result in much richer and more compelling designs. At the same time, the principle can help us to see our designs more systemically, holistically, and contextually. 6. Support needed functioning with multiple design elements – this principle is the reciprocal of seeking multiple functions from each design element and encourages diverse support of each needed function our outcome. It also offers opportunities for new creativity and design depth, while promoting functional resilience across a design’s various elements. At its best, shared or symbiotic cross-element support of functioning increases economy, reduces risk, and may improve total design performance. Consider the need to heat a building, and how multiple elements might contribute to and improve a design. Sun-facing glass, thermal floor mass, wall collectors, and a small heater might be combined to produce superior results relative to any one of these items taken on its own. And the approach simultaneously allows us to get multiple functions from each of these items – we can look through the glass, heat bath water with the collectors and heater, etc. 7. Pursue and carefully examine feedback – much like the principle of gathering multiple perspectives, permaculture design places high emphasis on feedback. This can be from others, via trials and testing of design ideas, and by examining the impacts of our designs once in place. The importance of this principle is of course very intuitive, but we frequently fail to adhere to it. This can be because of deadlines, limited familiarity with feedback techniques, or that we have not designed adequate time for and attention to feedback into our creative process. To provoke your thinking and creativity in this essential area, let me suggest that you should spend as much or more time getting feedback as you do designing and should have no less than five feedback mechanisms (whether specific people, groups, tests, evaluation methods, or other sources). I hope these seven permaculture design principles prove useful to you, bring new progressivity and learning to your creative endeavors, and ultimately improve the quality of your designs and projects. I also hope the principles will allow you to better, more skillfully, and more richly begin with your truest ends in mind. This entry was posted on November 18, 2013, 11:24 am and is filed under Buildings, Communities, Designs. You can follow any responses to this entry through RSS 2.0. You can leave a response, or trackback from your own site.